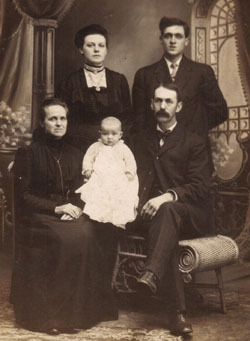 Children: Nora R., William M., Eugene H.
Special notes about this person: Verda and Harvey lived with Willoughby and Rebecca on the farm in Corning. She is remembered by great-grandson, Darryl Schlicher, by always having licorice allsorts or licorice bits in her kitchen cupboard. She would rock him on her lap, patting his back upper thigh, soothingly chanting, "Bye, byeee...Byyye, bye... ." Verda died 11 months after Harvey of kidney disease.